SUPPORTING WINDOWS 8 is an essential resource for current and aspiring PC repair technicians who need to know up-to-date information on how to support the latest Windows operating systems. 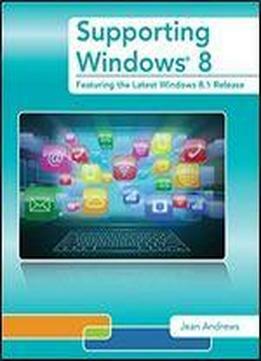 Wide-ranging and highly practical, the text provides thorough coverage of the differences between Windows 8, 7, and Vista how to install and maintain Windows 8 and tools for troubleshooting network connections. The text also examines security tools and techniques relevant to Windows 8 and explains how to troubleshoot startup errors and slowdowns. Labs for each chapter focus on support tools and techniques for Windows 8 that differ from 7 and Vista.